Pasta salad served over arugula and topped with goat cheese dressing. Combine dressing ingredients in a medium-sized bowl. Whisk with a fork and set aside. 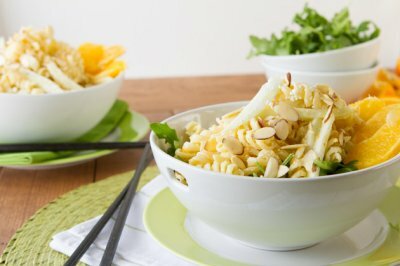 Combine pasta and fennel in a large bowl. Add dressing and stir to coat. Divide arugula into two serving dishes. Top each dish with half the mixture of pasta salad. 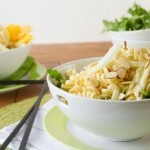 Garnish dish with orange slices and sprinkle with almonds.